Seasoned and novice runners alike are sure to tell you there is nothing more invigorating then hitting the open road for a run. In all seasons and at all levels the one thing people agree on is that pounding the pavement chasing that elusive runner's high is pleasingly freeing. It just makes you feel fantastic. It is vital to keep up to date with the latest trends, products and techniques and there are a plethora of online resources that reach across multiple platforms for you to tailor your attention based on your interests and skill sets. Some sites focus on reviews, whilst others may pay close attention to nutrition. Below we’ve listed five of what we consider to be the best running websites out there today. Some are well established and have quite a following and some are brand spanking new but none the less real gems we think are worth a gander. The running bug has dubbed themselves an online running community. Their pages are chock a block with handy articles covering everything from 4 health reasons to eat peanut butter to What to eat when training for a half marathon. They also feature plans and routines for training in events. It doesn’t matter whether it’s a speedy 5k or a full-on marathon they have you covered. You can utilize the forum to help answer any questions you have that can’t already be answered by the website and you can rest safe in the knowledge that all advice is coming from passionate individuals that just love running. Jogger is a news platform that manages to cover so many areas of the running world. Don’t let this worry you, however, each area is covered in an insightful, well researched and often entertaining way. As well as offering in-depth reviews on popular sporting apparel, supplements and the latest technology, they also take an in-depth look at how to better your performance, no matter what your age, experience or skill base. You can also access information regarding upcoming events around the entire UK enabling you to plan your next challenge with ease. Jogger is also one to watch if you love soaking up advice from experts in the world of running, interviews with some of your idols can be found for you to gain inspiration from. Worth a look today! 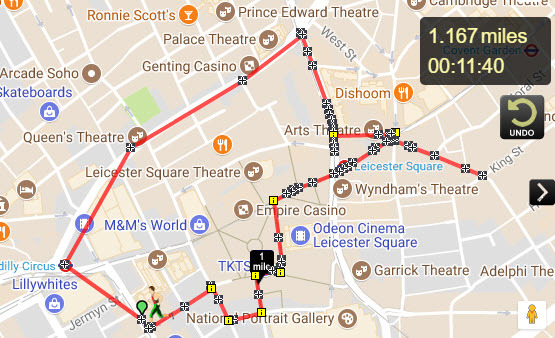 Good Run Guide is a little different from the other sites mentioned in that it features some very exciting tools to help you map out routes and keep track of your progress. Along with these tools the site still offers a ton of helpful articles. The routes section allows you to map your starting point and two further stop in points and then gives you a route to follow or if you prefer you can simply chart your route yourself. There are also tools to chart progress, weight loss, personal bests, friend’s times and races you’ve run. If you have a members log in the site can use all this information to give you an estimated run time on any route you plan. Is there anything Good Run Guide can’t do? This hilariously named site is the most blog-like of the bunch. Don’t let that fool you, however, this girl, who started it in 2012 to document her training as a non-runner now has 9 marathons under her belt and shows no signs of slowing down. She means Business! Her goal is to complete all major world marathons before the age of 30 and she only has two to go, so this blog is perfect for those suffering from a spot of Wanderlust. The travel section has the information for events at all corners of the globe, the recipe section is full of energy-dense nutritious foods to fuel your training and the workout section will motivate you to get moving even more. People of all levels are sure to find a whole bunch of useful articles from Charlie. This site states that John long-term personal goal is to complete 100 ultra-marathons by the times he’s 70 and he’s already got 40 secured. An ultra is any run longer than the 26 regular marathons so training is not for the faint-hearted. The site keeps detailed logs of all the training John completes along with advice and times. You can track his progress from 2006 to this very month and see how times and training habits have evolved. You’ve nothing to lose by checking out this exciting personal running diary, you may even be inspired to set up your own. These five running sites are just a few of our favourites and each one serves its users in a different way. We find the best way to use any running site is in conjunction with others to ensure you gain the most information-rich advice possible. Which site can you not live without? We’d love to hear from you.